British Official Air Ministry Press photograph, approximately 21.5 x 17cm. Dated January 8th 1941 with a Daily Herlald ink stamp dated 9 April 1941. Superb crisp image of Battle of Britain pilot Squadron Leader Don Osborne Finlay DFC. It shows Finlay in full flying kit with B-type helmet, MK.III goggles, type D oxygen mask with type 19 microphone attached, 1936 pattern flying boots, 1932 pattern Mae West etc. He is sitting astride the Spitifre 'Observer Corps', the aircraft was purchased with funds raised by the Observer Corps personnel of Fighter Command. Finlay was a champion hurdler before the war and won the silver medal in the 1936 Berlin olympics. He was given command of 54 Saquadron in August 1940 only to be shot down by Me109s over Ramsgate just 2 days later. Finlay baled out and survived and by September 1940 was CO of 41 Squadron at Hornchurch. By the end of the year he was credited with 3 Me109s 'kills', 1 Me109 damaged, a shared Do17 and a shared Me109. In August 1941 Finlay was promoted to Acting Wing Commander and posted to HQ 11 Group as Engineering Officer. He later destroyed a Me109 in March 1942 when flying with 485 Squadron. Finlay was awarded the DFC (gazetted 10th April 1942). 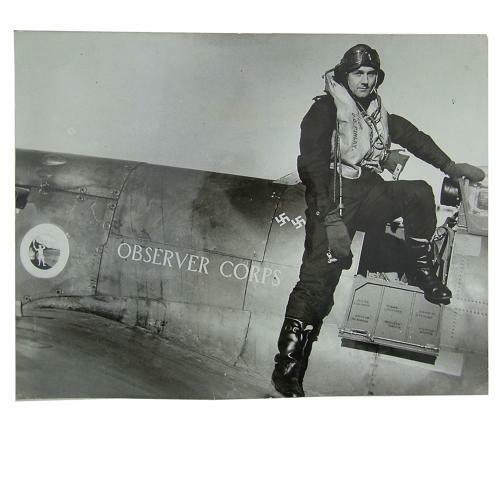 In July 1942 he damaged a Fw190 and was then posted to command 608 squadron in the Mediterranean. He was awarded the AFC (gazetted 1st September 1944). In 1945 Finlay commanded 906 Wing in Burma. A super photo with ful caption to the rear as well as a period newspaper clipping. Stock code P22873-103.